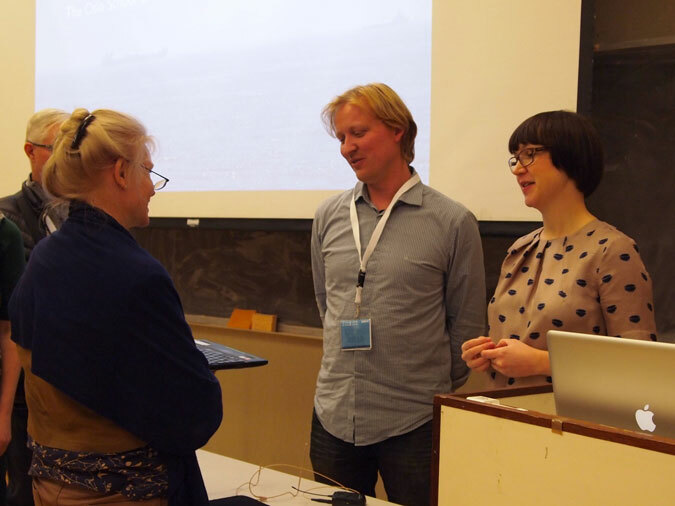 Last week the Ulstein Bridge Concept (UBC) was presented at the Relating Systems Thinking & Design 2013 symposium at the Oslo School of Architecture and Design (AHO). The symposium attracted 200 participants from all around the world, and offered 32 presentations by scholars and practitioners working at the intersection of systems thinking and design, including well-known thinkers like Fred Collopy, Harold Nelson, Carlo Vezzoli and Peter Jones. The presentation of the Ulstein Bridge Concept (UBC) project was given by Sigrun Lurås and Kjetil Nordby from the Ocean Industries Concept Lab at AHO. In their presentation they addressed how the bridge concept designed by the UBC project has affected Ulstein and AHO internally, as well as the offshore ship industry externally. Sigrun started the presentation by discussing the challenges of designing for this industry and the systems involved, before she described three interventions carried with the aim of changing these systems. Interesting discussions following the presentation. The first intervention was conducted in 2010 during the pre-study of UBC, the Ulstein Bridge Visions project. This intervention was internal and had the objectives of creating interest in the use of design within Ulstein and interest in the maritime industries at AHO, as well as to create a common goal and get commitment from the involved parties. High-end 3d visualisations were used to convey the concept and show the potential in using design when designing for such a complex domain. The results were that both parties committed and the work was taken further in the 3-year design research project UBC funded by the Research Council of Norway and the Ulstein Group. In August 2012, one year after UBC was initiated, the second intervention took place at the ONS trade fair and on the Internet. Up until this date the industry was unaware of the project and the objectives of this intervention were to create interest for the project in the industry, to communicate the project’s ambitions, to position Ulstein as an innovative company and to attract partners for further development of the concept. The strategy was to communicate the UBC bridge design to a broader audience through a professionally produced film. The film was first presented at ONS by the Norwegian Minister of Trade and Industry, Trond Giske, and head of marketing and innovation in ULSTEIN, Tore Ulstein. Immediately following the launch at ONS, the film was published online. “This intervention got a lot of attention, even more than we expected “, Sigrun explained in the presentation. The project got positive attention in national and international media and a number of potential partners from all around the world made contact. The intervention also resulted in project winning two innovation prices: DNB’s regional innovation prize for West Norway and DNB’s national prize for the best Norwegian innovation idea of 2012. All this positive feedback made Ulstein commit to carrying out a third intervention. The intervention also made AHO even more committed to design for the ocean industries, and AHO established one new full-time position with the task of setting up a research group dedicated design for these industries. This research group, called the Ocean Industries Concept Lab, is now up and running and have already carried out new projects. The last innovation took place in June this year at Nor-Shipping, a major trade fair for the maritime industry that takes place every second year. The second intervention had resulted in a lot of expectations from regulatory authorities, competitors, users and other stakeholders, and the objectives of this third intervention was to create trust in that the vision is achievable. This was done through presenting an interactive demonstrator which allowed the audience to test themselves a lot of the novel designs shown in the film of the second intervention. The demonstrator gained a lot of positive attention from a wide range of stakeholders, including end-users, representatives from shipping companies and regulatory authorities. The presentation was concluded by the following claim: “A user-centred approach alone is not enough when designing for such complex systems. In our opinion, to innovate the bridge environment, we must activate the full range of stakeholders.” The UBC team has experienced that clear and trustworthy communication of the concepts is necessary in order to impact these diverse stakeholders. By using designers’ abilities to visualise and communicate possible future visions, the end-users know that a different bridge than the current is possible, the regulators have seen that their goals can be achieved by different means than what is used today, Ulstein has experienced the potential they have and Ulstein’s competitors know that they need to focus on design to avoid being left behind. The full presentation and a working paper version of the presentation will be published at the symposium website.